Time to send the little ones back to school, which means making daily lunches to ensure their tummy stays full. 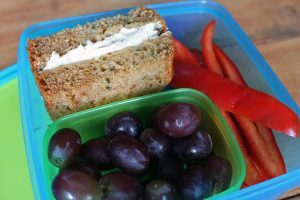 Below are some great ideas for daily lunch options that is sure to please the smallest palette. Right now zucchini’s are in abundance, so make a weekend project of making a couple loaves of zucchini bread and toss them in the freezer. Great way to mix up the typical sandwich. 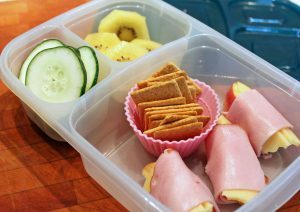 Serving the ham and cheese with apples adds a bonus of additional fruit, plus the kiddos can take them apart and eat them in any kind of combo they want- which gives them an added choice at lunch. Great way to use up leftovers from Mexican night at our house – substitute any of your favorite Mexican items like salsa for the guacamole or add some chicken or beef. We toss the dry cereal in a tupperware and fill the thermos with milk. That way the milk stays nice and cold and my daughter can pour the cereal right into the milk, using the thermos as her bowl.